Rubi Rodriguez (Left) speaks with President Patrick White (Right) after the Student Senate Forum on March 27, 2019. More students attended this year’s Student Senate forum on Tuesday, March 26, compared to a similar event held last year. 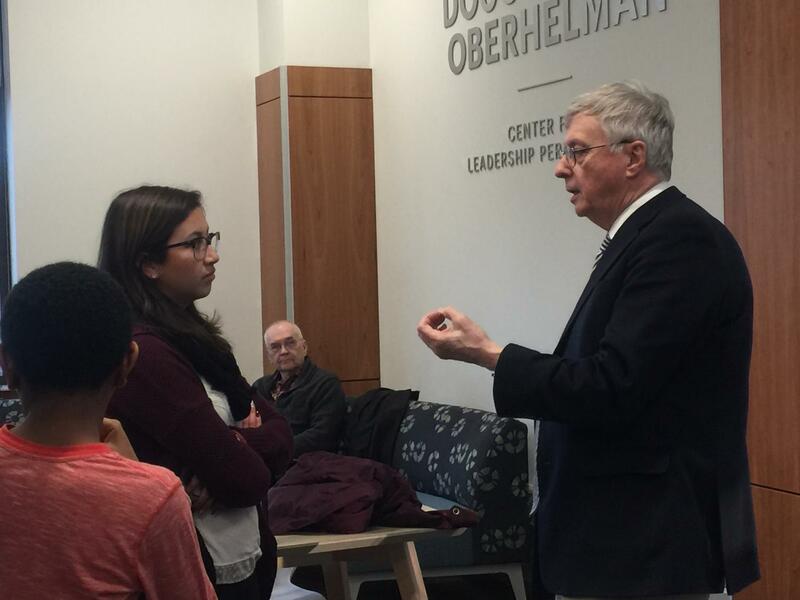 Students, many of whom are leaders on campus, met President Patrick White with a range of questions. President White initially received a list of more personal questions. Many pertained to his retirement next June. Student leaders from different organizations came to find answers about student life instead. “We didn’t even have to use our staged questions, really, because people brought their own inputs and we were able to get a lot of really good discussion out of it,” Collin Krakowiecki, Student Senate’s Vice President of Academic Affairs, said. Zach McReynolds, a sophomore, asked President White about efforts to make the Woods situation more transparent for students. “I’ve searched for months to get answers to that and every person I talk to points me in another direction or deflects everything I have asked them,” McReynolds said. At the Woods, McReynolds needs to move three times a year: once in the fall, spring, and summer. He moved to Decatur year-round to pursue his career and, due to his presidential scholar status, is exempt from the Woods’ senior discount. “Your environment is a huge part of your mental health and, personally, my mental health has suffered from living there and every time I try to find an alternative, it’s an alternative that strips me of even more of my agency,” McReynolds said. Alternative housing such as the Millikin East/West Apartments has an RA. Regardless, students can speak with Ruby James if they would like to see the contract. President White confirmed that the Woods contract allows for rent to rise 5% each year. He then brought to attention that only 7% of alumni are giving back to the university. When President White came to Millikin, it was virtually broke. Rubi Rodriguez, the president of Latin American Student Organization (LASO), asked about how Millikin was addressing the distractions that students who are facing the threat of deportation, either of themselves or of their families, endure. “I think we need to be much more attentive to that issue,” President White said, though at first, he did not give a clear reason how Millikin would address that issue. Instead, his response related more closely to how Millikin is working with more international students, mentioning the university’s searching for a new director for the Center for International Education. He spoke with Rodriguez after the forum ended about how to address the issue. President White will continue to help students answer their questions. “I think the students showed really good attention and the kind of leadership you expect out of them,” President White said after the forum. Students can follow MU Student Senate on Twitter to find out who their student representative is and to bring up any more questions and concerns.